A basket-type hot air fryer is a dedicated air-frying machine in which the food is cooked in a basket. The basket usually has a handle for easy tossing of the food at one or more intervals during cooking. Basket-type have fewer moving parts so may prove to have a longer life span, depending on the make. Some people say a basket-type air fryer is basically a convection oven with a high-powered blower, and a basket. But, on most models, the air flows inside are actually designed to mimic the flow of oil in a deep-fryer, so there is a fundamental difference. Note that almost all models so far seem to use an upper heating element as the heat source. One or two, though, use halogen bulbs as the heat source. If you purchase a halogen-powered one, be sure to enquire thoroughly first what you do when the bulb burns out — some makers hard-wire them in so that burnt out bulbs are not replaceable. The Quik N Crispy commercial basket air fryer was invented some time before 1990, but the first basket-type air fryer for home use was released by Philips in 2010. Since then, many different makes have been released which are similar to the Philips design, in all different price ranges. 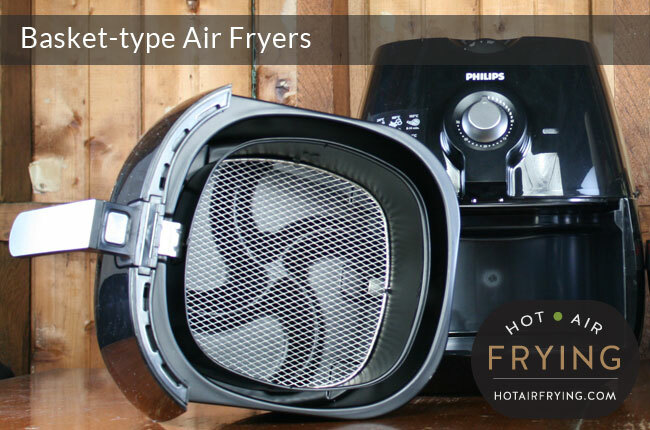 Note: We have made the Philips AirFryer a top-level category of its own because of its predominance in the field.